Everyone should watch this anime. Sure it's slow in the beginning and has it's downsides, but overall anyone would be missing out on one of the best, if not the best anime experience. Just a little patience for the first couple of episodes really pays off. It's very rare that I'm left disappointed in a Gundam series. Usually I associate Gundam with a certain level of sophistication that despite the philosophical rhetoric that each series delivers, they seemed to have strong characters and a strong narrative that supports it. That is not the case with Gundam Seed. I've never seem so many illogical and nonsensical action performed in one series that it's baffling. There are so many logic jumps, unexplained events, characters brought in for no purpose other then for them to die later that it feels like the usually quality that the Gundam is associated with, just feels like a high school play. I'm not even going to get into the shoddy artwork and character design of the series because I think that would be beating a dead horse. I would suggest if you're planning on watching through the Gundam series that you either watch this first then move onto some better series like Iron Blooded Orphans or Unicorn, The 08th MS team. Or just skipping this entirely. I literally had to drag myself to finish this series and I plan on waiting a long time before watching the sequel series. Dated, but still a ton of fun! Although the story drags in parts and the stock footage becomes a little too blatant in some episodes, I still had a good time with this show. To be blunt, the story is a Re-imagining of the classic Mobile Suit Gundam, with a backdrop of early 21st century ideas of the future. A particularly interesting aspect of the show is it's discussion of genetics and genetic modification (the latter of which plays heavily into the "war" of the show, which surprised me given the shows original air date). Although some of the action sequences devolve into stock footage showcases, some of the battles are still a lot of fun. Most have a heavy "Star Wars" vibe with ships flying around and shooting lasers (and other science-y projectiles). As I usually say, if you turn your brain off for some of the more stupid and dated aspects of the show (every machine has an IBM style keyboard built into it so it can be... hacked? Did I mention this was made in the early 2000's?) you can still have a pretty good time! I should also mention that the soundtrack is pretty good and the mecha-designs are also pretty fun! Additionally, this is the HD remaster which changes some of the original scenes (one of which is very spoiler heavy) and removes the re-cap episode in the middle of the series. Overall, I'd still recommend it if you want to check out one of the more successful Gundam stories and franchises. It's not perfect, but it is still very entertaining and I do find myself re-watching it usually twice a year! You know that haters just have to hate. While many people love Mobile Suit Gundam Seed you will sometimes find detractors that vehemently hate the series for its use of standard Gundam tropes. 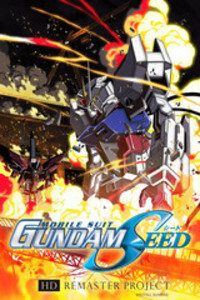 Yes MSG Seed does have a strong correlation with the original MSG and it does build on what most fans love in a Gundam series slick mechs, cool beam effects, ridiculous drama. So while I'll agree that this is no 8th-MS Team or MSG Wing it's still a worthwhile contribution to the catalog that is Gundam and I'm proud to say that I love that Crunchyroll has given it to us to enjoy again. This is my first foray into watching a Gundam series. Throughout my childhood I had heard or seen brief clips, clips, games, etc about the franchise but never really found the time to get into it. I'm halfway through Gundam Seed and really enjoying the story. Action sequences are great, the characters are fleshed out as well. But my goodness, I really do not like Flay. Gundam Seed is one of my favourite animes of all time and I have rewatched it about 8 times (so far)! A great mix of action, suspense, drama, and romance. Great characters who you love to learn more about and watch grow. An anime in which the characters actually get hurt sometimes, so don't expect them to get out of situations unscathed! Highly recommend, and out of the few Gundam series' that I have watched, it is my favourite, closely followed by the sequel Gundam Seed Destiny. This show is what Zeta Gundam would have been if they had bothered to give any background for what was going on, or do any character work for...well, anyone. It's what Gundam Wing would have been if they had hired writers or done any world building, and it's what the original Gundam could have been if any of the characters had been interesting or likeable. Yeah, it has a problem with same face. And yes, Kira Yamato is treated as if he is the son of god almighty himself. But Gundam SEED is one of the very few Gundam anime when when something happens, it is for a well-explained reason, and not because the writers just wrote down the first thing they thought of. It is a retelling of the original gundam to a certain extent, only - as I said - it makes sense, and the characters are both memorable and likeable. Also, there are no annoying little kids running around, and while Kira is capable of extreme emo, he is only ever emo on his own time, and not in combat, which is something that I'm pretty sure no other Gundam protagonist can say. A great show with realistic characters and political scenarios. It also really keeps you at the edge of your seat and really conflicts you on who to really "root" for up until the end. This show keeps you on the edge of your seat truly one of my favorite shows of all time. This is also one of the few shows where the dub is just as good as the sub! I hope they upload the remastered dub. This is a classic that anyone can ease into the gundam series with I highly recommend to give it a fair shake it will blow you away. This got me into the gundam, I never regretted it as I keep watching this gem and suggesting it to others. With two solid seasons chalked packed with great episodes its a must watch for any mecha fan.